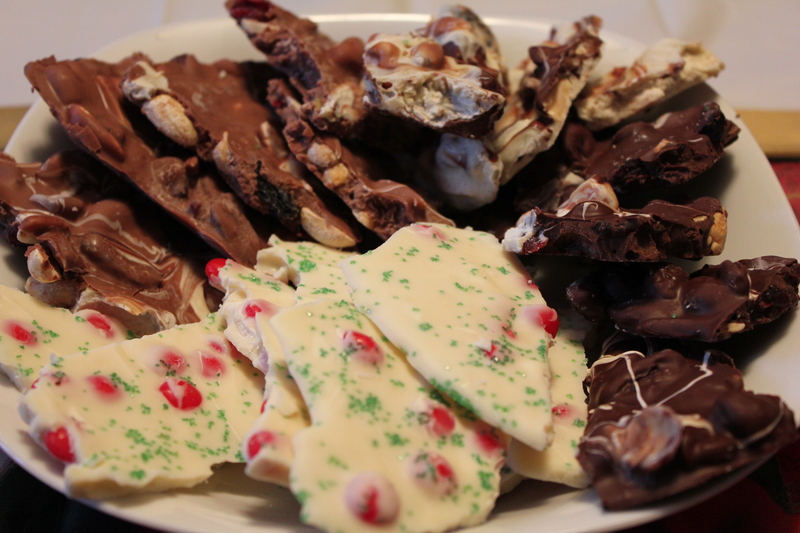 I made two different kinds of chocolate bark for our holiday cooking-decorating party. Triple chocolate bark filled with nuts and dried fruit. Chop larger dried fruits, like apricots and cherries, before adding to the mixture, keep everything about the same size. I also made white chocolate bark with red cinnamon dots and green sugar crystals for a festive holiday look. I love those red cinnamon dots – you can always identify the cookies I decorated by how many cinnamon dots are on the cookie! The recipes are easy to make, but it’s best to make them the day before to give ample time to set. You can briefly put them in the refrigerator if you want to speed up the process. There are two options to melt chocolate: in the microwave or on the stovetop in a double-boiler. If you don’t have a double boiler, take a medium-sized pot, fill with water by 1/3 and bring to a boil. Lower the heat and place a bowl with the chocolate, one that fits securely on the top, over the water. Don’t let the water touch the bottom of the bowl. The chocolate melts from the heat of the steam. These make a nice treat after dinner or as part of a cookie-gift package. 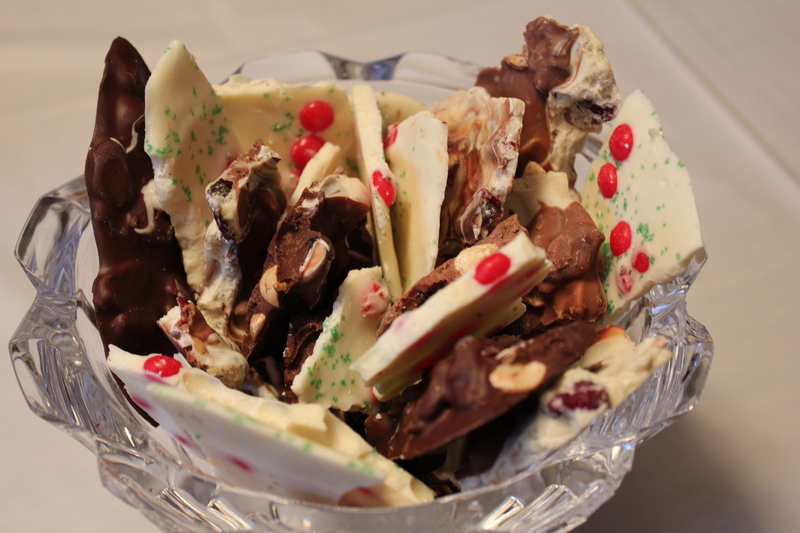 Chocolate bark is fun to make and a nice treat for your family and friends after dinner with coffee or as a holiday treat. Line a cookie sheet with parchment paper or Silpat. Place white chocolate a microwave-proof bowl and heat high for 45 seconds. Stir to mix the melted and unmelted chocolate. Microwave on high for another 30 seconds. If there are a few small chunks, continue to stir. The hot, melted chocolate will remedy those few pieces. Stir in the red cinnamon dots and pour the chocolate onto the parchment and spread with a knife or the back of a spoon to smooth. Sprinkle top with green sugar crystals and let the chocolate sit overnight to set. Cut into shapes or break into random pieces. In the top pan of a double boiler place the stir occasionally until melted. Stir in the red cinnamon dots. Pour onto the parchment paper and spread with a knife or the back of a spoon. Sprinkle with the green sugar crystals and let sit overnight. Cut into shapes or break into random pieces. If you don’t have a double boiler, take a medium-sized pot, fill with water by 1/3 and bring to a boil. Lower the heat and place a bowl with the chocolate, one that fits securely on the top, over the water. Don’t let the water touch the bottom of the bowl. The chocolate melts from the heat of the steam. Note: unable to incorporate the cinnamon dots into the nutritional analysis program. The entire recipe has approximately 1245 calories. Line a cookie sheet with parchment paper or silat. Place each chocolate in a separate microwave-proof bowl. Place in the microwave on high for 45 seconds. Stir each bowl to mix the melted and unmelted chocolate. Microwave on high for another 30 seconds. If there are a few small chunks, continue to stir. The hot, melted chocolate will remedy those few pieces. Stir in 1/3 of the nut and fruit mix into each bowl and pour each chocolate, separately, onto the parchment and spread each with a separate knife or the back of a spoon to smooth. Make whatever design you like, crisscross or side-by-side. Draw a knife through the chocolates to create abstract designs. Let the chocolate sit overnight to set. Cut into shapes or break into random pieces. In the top pan of a double boiler place the one of the chocolates and stir occasionally until melted. Stir in 1/3 of the nut and dried fruit mixture. Pour onto the parchment paper; don’t spread the mixture until the other chocolates are on the parchment paper. Clean the pan and repeat with the next two chocolates. Spread each chocolate as described above and let sit overnight to set. Cut into shapes or break into random pieces. Chop larger dried fruits, like apricots and cherries, before adding to the mixture, keep everything about the same size.